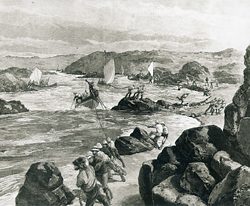 The Nile Voyageurs negotiate the river’s second cataract in November 1884. For that historic journey, a large number of guides, Indians and voyageurs were hired to assist with the transportation of Wolseley’s 1,400-man force. The difficult part of the expedition began on the shores of Lake Superior, near the present-day city of Thunder Bay, Ont. It ended 13 weeks and 1,050 kilometres later at Fort Garry. The men travelled in boats measuring nine metres in length, and along the way they encountered a difficult chain of raging, rock-strewn rivers and numerous lakes. They also endured almost 50 backbreaking portages through thick forests and swampy muskeg. Riel had fled to the United States by the time the expedition reached Fort Garry in late August of 1870. Wolseley returned to England a minor hero and his soldiers resumed their peacetime existence until circumstances in a remote area of Africa drew many of them together again. The Mahdi, a Muslim religious leader, had united various Sudanese tribes under his leadership and soon was in control of most of the country. Major-General Gordon, sent to evacuate Egyptian soldiers and officials, only removed a few hundred to safety before being besieged at Khartoum in March 1884. The British government procrastinated over what to do, although the public overwhelmingly clamoured for a relief expedition. Wolseley, now the army’s adjutant-general, urged the same action. Time was short, but he had a plan to reach Khartoum via the Nile, which the government finally approved. Wolseley’s idea was immediately denounced from several quarters, but the general remained firm. Among his key subordinates in Egypt were several who had served with him in Canada, one of whom supervised building 800 boats in England for Egypt. The finished product, a modified Royal Navy whaler, measured almost 10 metres long, two metres wide and three-quarters of a metre deep, and was equipped with 12 oars, two masts and a removable rudder. It could carry 12 men with enough food and ammunition for 100 days, and often carried up to an additional four tons. But just as important as the boats was the question of who would man them. The telegram received on Aug. 21, 1884 from the British Colonial Office to Lord Lansdowne, the Governor General, proposing “to engage 300 good voyageurs from Caugnawaga, Saint Regis, and Manitoba as steersmen in boats for Nile expedition,” started the recruitment of Canadians for Wolseley’s rescue operation. Prime Minister Sir John A. Macdonald had no objections, providing Britain absorbed all costs. An Ottawa lumber broker undertook most of the recruiting and general administration of raising the force. One hundred and seventy-one men came from a recruiting office in Ottawa, while 91 came from Winnipeg. Caugnawaga produced 56 while Trois-Rivières, Que., Peterborough, Ont., and Sherbrooke, Que., raised 39, 15 and six, respectively. The ages of the boatmen varied from several 18-year-olds to the oldest at 64. They were about half English- and half French-speaking, while over 100 were Indians or Métis. The monthly wages were $40 for ordinary boatmen and $75 for foremen. 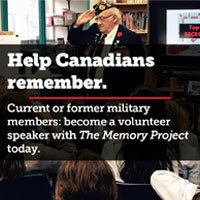 In Manitoba, 45-year-old Lieutenant-Colonel William Kennedy was responsible for enlistment. A member of the 90th Winnipeg Battalion of Rifles, he was a Red River veteran and a prominent lawyer and politician. Although he recruited some useful men, he also accepted several Winnipeg businessmen who were “hopelessly inefficient” as boatmen. Several serving Canadian military personnel accompanied the expedition to command and administer the Canadians. The commanding officer was another Red River veteran, Major Frederick Denison, 37, of the Governor General’s Body Guard. Denison, a Toronto lawyer and alderman, was promoted lieutenant-colonel for the expedition. Kennedy, senior in rank to Denison, inserted himself into the contingent with the support of a large number of Manitoba Ojibwas. He dropped a rank to major, and was appointed paymaster. Another Red River veteran, Surgeon-Major John Neilson, medical officer of B Battery, Regiment of Canadian Artillery, became the contingent’s doctor, accompanied by Hospital Sergeant Gaston Labat from the same unit. With numerous Roman Catholics among the men, a Canadian priest, Abbé Arthur Bouchard, a former missionary in the Sudan, became chaplain. In all, 379 “generally suitable” boatmen and seven officers were recruited. The contingent sailed from Montreal on Sept. 14, 1884, bound for Alexandria in far away Egypt. The raising of the force was a remarkable feat; recruited and dispatched in 24 days from receiving the Colonial Office telegram. Chief William Prince of the Manitoba Ojibwa–another Red River veteran–was a foreman. His descendants continued to render distinguished service in their country’s wars, including Sergeant Tommy Prince, who fought in World War II and in the Korean War, winning the Military Medal and the American Silver Star for his bravery. After Wadi Halfa, the real tough work began. It was backbreaking labour 13 to 14 hours a day, wrestling the heavily laden whalers through increasingly rough waters. But with the arrival of the Canadians, the pace picked up; their experience in handling small boats proved its worth over the earlier “amateur fumblings” of the British soldiers. The first hurdle–the second cataract–on the journey south was overcome within 10 days of the voyageurs’ appearance by a combination of rowing, sailing and towing. The Canadians also experienced their first fatality on the Nile when Louis Capitaine, 28, a Caughnawaga Mohawk and father of three, drowned Oct. 30. As the expedition slowly worked its way upriver through November, a typical day saw six soldiers rowing each boat, with a voyageur at the helm or bow. When strong currents were encountered, the men either bulled through or pulled the boat by ropes from the shore, with the helmsman and bowman left on board. Strong rapids required several crews to haul each boat through, slowing down the pace. In mid-November, still hundreds of kilometres from Khartoum, a message from Gordon stated he could hold out for only another 40 days. Wolseley figured he could make it in time, but knew it was going to be very close. Working under the scorching sun, Canadian boatmen and British soldiers did their best, knowing the Empire’s reputation, as well as people’s lives, depended on their efforts. But it was all too painfully slow. And the “bad, bad” river took its toll. By the end of December, seven more voyageurs had died: five by drowning and two by disease. Another problem also loomed on the horizon: the Canadians’ six-month contracts ended on March 9. To encourage re-enlistment, an additional $20 a month was offered–more than twice what they earned by logging. But throughout January 1885 only 89 voyageurs re-enlisted, others wanting to return to Canada for springtime logging. Meanwhile, Wolseley sent a large force 280 kilometres across the desert by camel, in a shortcut avoiding a great 650-kilometre bend in the Nile. With several of the most difficult parts of the meandering river behind them, this lessened the need for as many Canadians. Accordingly, those who did not re-engage departed in late January under Aumond. On the return journey, two of the Ottawa voyageurs fell off a train and were killed. The contingent left Alexandria in early February and arrived home to an enthusiastic reception. The Ottawa group marched through city streets lined with cheering spectators to the drill hall for a welcome dinner on March 6. Although the returning Canadians had accomplished much, many of their comrades were still struggling on the Nile. The adventure was far from over. As Wolseley’s 2,400-man desert column set out across the sands, the remaining voyageurs under Denison continued to work the boats with the 3,000-man river column, encountering one of the roughest stretches of water. On Feb. 5, a messenger arrived with the news Khartoum had fallen on Jan. 26, two days before the desert column reached the city’s outskirts in its futile race across the arid wilderness. Gordon was killed in the onslaught, his severed head displayed in the Mahdi’s camp. The elaborate expedition, had failed. The British government now directed Wolseley “to smash up the Mahdi.” To do this, he decided to wait until cooler fall weather while reorganizing his forces. Meanwhile, the river column continued its struggle as seasonal falling waters made the river more difficult. What’s more, the victory at Khartoum encouraged the Sudanese to attack the column. However, the Battle of Kirbekan was over in a few hours. The lightly armed Sudanese were simply no match for the disciplined firepower of the British Army. The non-combatant voyageurs were instructed to remain behind as the troops advanced, but “a few managed to get away and went up and saw the fight,” as foreman Alex McLaurin reported in the Ottawa Free Press. When Wolseley recalled the river column, the skill of the Canadians came into play as never before; the boats had to run the river. Orders directed, “In difficult rapids special arrangements will be made for taking each boat through with Canadian pilots.” One section, 30 days in ascending, took only nine to descend. On March 8, the river column reached Wolseley at Korti. With a long summer pause before he started his fall campaign, he allowed any Canadians who wanted to go home to do so. The Nile Voyageurs decided unanimously to return and, on March 13, left for Alexandria. When they sailed for England on April 17, Kennedy led them as Denison was hospitalized with typhoid fever. Disease had also claimed four more Canadian lives since the beginning of the year. On May 15, the boatmen sailed for Montreal. Canada’s first overseas mission was over.